WordStat is a flexible and easy-to-use text analysis software – whether you need text mining tools for fast extraction of themes and trends, or careful and precise measurement with state-of-the-art quantitative content analysis tools. 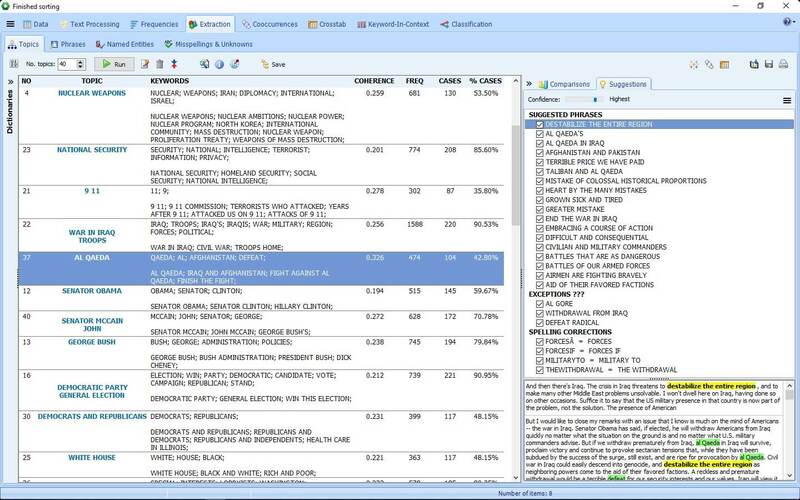 WordStat‘s seamless integration with SimStat – our statistical data analysis tool – QDA Miner – our qualitative data analysis software – and Stata – the comprehensive statistical software from StataCorp, gives you unprecedented flexibility for analyzing text and relating its content to structured information, including numerical and categorical data. Import Word, Excel, HTML, SPSS, Stata, NVivo or PDFs. Connect and directly import from social media, emails, web survey platforms, and reference management tools. Powerful content analysis and text mining software for handling large amounts of unstructured information. WordStat can process up to 25 million words per minute and identify all references to user-defined concepts using categorization dictionaries. Integrated exploratory text mining and visualization tools such as topic modeling, clustering, multidimensional scaling, proximity plots, and more, to quickly extract themes and automatically identify patterns. Get a quick overview of the most salient topics from large text collections by using state-of-the-art automatic topic extraction techniques. Relates unstructured text with structured data such as dates, numbers or categorical data for identifying temporal trends or differences between subgroups or for assessing relationships with ratings or other kinds of categorical or numerical data. Use existing or create your own hierarchical content analysis dictionaries or taxonomies composed of words, word patterns, phrases as well as proximity rules (such as NEAR, AFTER, BEFORE) for achieving precise measurement of concepts. Truly unique computer assistance for dictionary building with tools for extracting common phrases and technical terms and for quickly identifying in your text collection, misspellings, synonyms, antonyms and related words. One-click access to keyword-in-context and keyword retrieval tools for easy identification and coding of relevant text segments, validation of content analysis dictionaries, word-sense disambiguation or for drilling down to the source documents. Seamless integration with a state of the art qualitative coding tool (QDA Miner), allows more precise exploration of data or more in-depth analysis of specific documents or extracted text segments when needed. Machine Learning for automatic document classification using Naive Bayes and K-Nearest Neighbours algorithms with automatic features selection and validation tools. Classification models may then be saved on disk and reapplied on new data. Easy importation of databases, spreadsheets and documents (including PDF and HTML) as well as exportation of text analysis results to common industry file formats (Excel, SPSS, ASCII, HTML, XML, MS Word) and graphs (PNG, BMP and JPEG). GIS Mapping module to create interactive plots of data points, thematic maps, and heatmaps, along with a Geocoding web service for transforming location names, postal codes and IP addresses into latitude and longitudes.